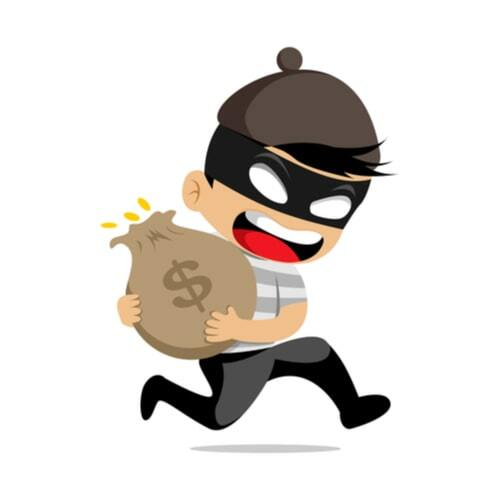 With the coming holiday season, it's pretty common to feel stressed out with the extra expense of decorating, buying costumes, and even the pounds and pounds of candy for trick or treaters. But Halloween doesn’t have to be a break-the-bank holiday. There are many ways of celebrating this spooky holiday without emptying your bank account! Decorating is one of the most important parts of setting the scene for your spooky festivities, but that doesn't mean you have to give your finances a scare! 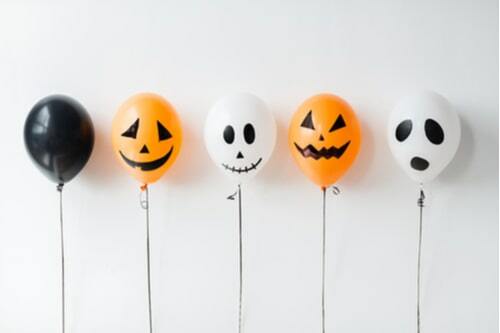 Check out these easy DIY solutions to your Halloween decor situation. This is the perfect do-it-yourself decorations for the people that are not the best with arts and crafts. With only a clear fishing line and a sewing needle, you can create this yummy holiday decoration. All you need to do is thread the needle with the fishing line and push the needle through the candy corn, pulling them onto the string! It is that simple! You can string these colorful treats through your home, in your window, or even outside! By simply cutting out some Halloween themed shapes, you can transform your lampshade into a spooky display for your home. Use black construction paper to cut out witches, bugs, ghosts, or any eerie shape and tape it to the inside of your lampshade. When you turn on the light, voila! A creepy surprise for your guests! Another simple cost-efficient decoration is a smoking cauldron. You can purchase a few black cauldrons at your local dollar store or drugstore and some dry ice. 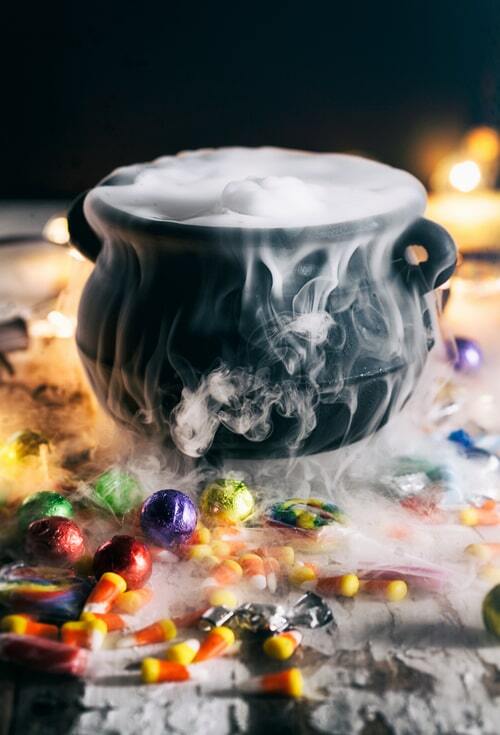 If you decide to throw a party and serve punch or drinks, you can serve them in the cauldron with a little bit of dry ice. This will cause the fog to come out of the cauldron, adding an extra witch-like effect! Before creating your own decorations for Halloween, you can always check the dollar store. If you need some extra cash for this, a title loan may be just what you need. Around the holidays, it is common for dollar stores to keep some tinsel and lights in stock to help with things you might not be able to make on your own. At these low-budget stores, you can also collect the supplies needed for your DIY decorations! This is a costume that you may not have to spend any money on, depending on what you have in your wardrobe. All you need is a black and white striped shirt and black pants. You can also get a black beanie hat and cut eye holes out to pull down your face for the added criminal effect. Another way to really sell the costume is by making a fake bag of money. You can use any canvas bag and paint a gold dollar sign onto it! This entire costume can be made with items in your own closet. If you are the type that likes to put together a funny costume for Halloween, this could be perfect for you. Wear a purple or black shirt and pants to start. Then, blow up a “bunch” of purple balloons and tape them to your clothing. Lastly, cut a green leaf and stem out of cardboard, felt, or whatever works best for you and tape it to your shoulder. This costume will sure get you some laughs, and maybe a prize at a Halloween party! A black cat is a classic and easy DIY costume, but it doesn't have to stop there - a cat and mouse could be the perfect couple's costume, and animal costumes are easy to put together in a snap. Mostly, they just require some ears and the right clothes, and a little make-up can go a long way! It is especially important to save money for Halloween with Christmas coming! By creating a low-budget Halloween, you can relieve some of the stress of the coming Winter holiday.